In the beginning, there was News Feed. Then Facebook gave us Timeline. Now, Zuckerberg et al are introducing Graph Search, an innovative search tool that will organically lead prospective clients to your Facebook page using their “social graph”—a map of sorts that depicts users’ social network connections. We all want to be found, right? That’s why there’s no better time for PIs to get acquainted and optimized for Graph Search, in advance of its global launch. For several years, I’ve been a social media consultant and part-time blogger for businesses large and small and various industries (including quite a few PI firms). I get a lot of blank stares when I share a new social media or internet marketing tactic. I like to describe it as the “not again? !” face, an expression that suggests that the listener’s brain cannot absorb any new information about the ever-changing world of social media marketing. I really do feel you! But for me, the power of Graph Search isn’t overwhelming. It’s exciting… so exciting, in fact, that I created this quick case study and how-to using an international business—Wymoo Private Investigation Company—and a local business—Long Island Private Investigator. After examining their pages with a magnifying glass, I came up with a few recommendations that you can easily implement to get maximum exposure and inbound leads from the upcoming Graph Search launch. 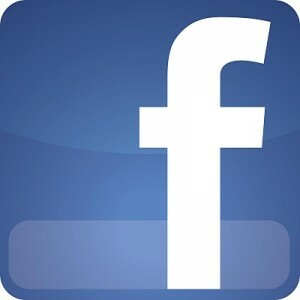 What is Facebook Graph Search, and why should you care? The new Graph Search concept is much more dynamic and returns results based on the user’s social relationship with the search term. Users can now type in customized search queries like “private investigators in Pennsylvania” or “my friends who like background check companies.” Facebook then ranks the results based on social data, like the number of users you’ve engaged through likes, shares, and comments and how they relate to the individual performing the search. The search tool is still in beta testing, but I highly recommend taking it for a test drive by joining the Facebook Graph Search wait list. I was lucky enough to be an early adapter, and I’ve really enjoyed practicing various search queries like “Long Island private investigator,” which is how I found one of the pages used in this study. If you’re just getting starting with Facebook Pages, you’ll be faced with an important decision right off the bat: Are you a local business or a company? Yes, you are technically both – but what’s best for your search rankings? Company pages are best suited for national or international investigations companies like Wymoo. Since the company is headquartered in Florida (but does not conduct local business), a place page is unnecessary. Because Wymoo has an international presence, clients are less likely to search for it using localized search terms, which will be a big part of Facebook Graph Search. But don’t worry: If you’re an international company, there’s still plenty you can do to increase your rankings, which I’ll discuss in just a minute. Names and vanity URLs are the first step of social graph optimization. Selecting a descriptive page name and vanity URL will increase your page’s chances of social discovery. When it came to page names, Wymoo kept it simple, using just their official business name:(http://www.facebook.com/wymoointernational). The Long Island Private Investigator firm was lucky enough to have a valuable keyword in the actual business name, so of course they used it: (http://www.facebook.com/longislandprivateinvestigator). If your agency is named after the owner or sole operator, “John Smith, Private Investigator” is an acceptable page title. While setting up or editing your page, be sure to set up a vanity URL. The vanity URL should represent your page name. This shortened URL will make it easier for your current and prospective clients to discover and revisit your page. Define your business with categories and keywords. You can choose categories when you create the page or edit them later through your page admin panel. International companies like Wymoo will likely have to choose “Professional Services” for a category. Local businesses like Long Island Private Investigators are able to add place topics to their pages by choosing specific subcategories. LIPI chose “Private Investigator” as keywords. This field will play a huge part in the global launch of Facebook Graph Search, so be sure to select up to three subcategories related to your business that will make it easy for social searchers to find you. Get people checked in with addresses. As I mentioned earlier, addresses play a larger role in local Facebook Graph Search. 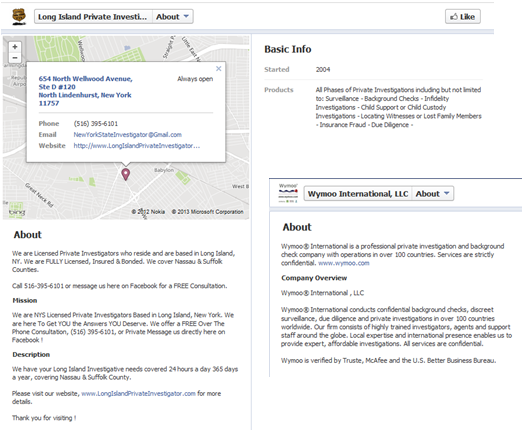 International companies like Wymoo target an international audience, while the Long Island Private Investigator company segments its market by location. Although Wymoo still has its address on its page, compared to a local business, it’s not as prominent. If a local business or place optimizes its address properly, agency employees and clients will be able to check into the office using mobile Facebook apps. The ability to check into a location and have that location linked to a page will build up the social force behind your business page, thus increasing your Facebook search rankings. These stories will also show up on your client or employee’s news feed, giving your company increased visibility. Remember that Graph Search will send people to your Facebook page rather than your website, so it’s vital that key information can be found effortlessly. This data will also be used as part of the Graph Search algorithm, so while you’re writing, try to think like your clients – what terms will they use to search for you? Get social and make friends by posting quality content. Comparable to Google’s search results algorithm, Facebook “likes” will be weighed heavily — much like quality backlinks in traditional SEO. These rankings will also depend greatly on the extent of a page’s social interaction. If people are just “liking” your page and aren’t liking posts, commenting on statuses, or posting on your wall, your page will likely be trumped by another PI who is creating conversations. I always hear “content is king,” but I think that with this new venture, content is going to be MORE than king (yes, it’s possible). News articles are great, but I think the Long Island Private Investigator page wins for creativity. They’re checking in to different locations using Facebook mobile while performing surveillance. These check-ins spur curiosity on their page, which creates conversations and engagement. The recommendation feature may also come in handy, so encourage current and past customers (especially those you’re still closely connected with) to write a quick review of your service. Again, similar to Google and their review system, several quality Facebook recommendations will boost your social rank. 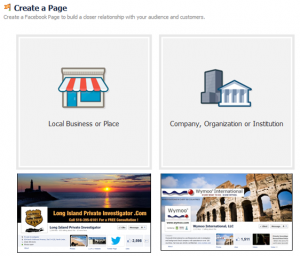 Whether you’re a Facebook beginner or a seasoned marketing pro, optimizing your page for high Graph Search rankings should be easy if you use this article along with page guides like Wymoo and Long Island Private Investigator. If you have any questions on Graph Search optimization, please feel free to comment, and I’ll help you as best I can! Katie Elizabeth is a social-media obsessed freelance content coordinator, blogger and grad student from Pennsylvania. She’s worked as a consultant with many small investigation, real estate, and retail businesses. If she wasn’t already drowning in student debt, she’d consider a PI education too. Follow her on Twitter. Fascinating! Thanks for the great information.